In the early ages occult knowledge was taught openly, as the sciences are taught in our colleges to-day. But in the course of time many allowed their selfishness to rule and so abused their power that it became necessary to withhold such knowledge from the unworthy. This was the condition of religious affairs when the Mysteries were necessarily established by the King-Priests of the Divine Dynasties, in the early days of Atlantis. 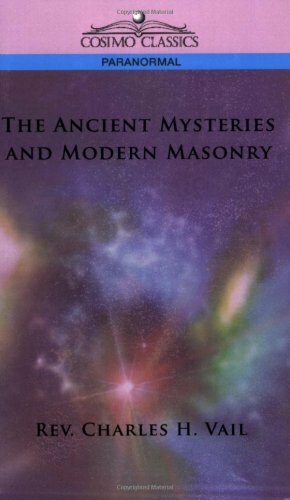 -from "The Origin of the Mysteries" Though the author cannot, alas, "lift the veil from the secrets of the Order," 32nd-degree Freemason Charles H. Vail endeavors to lead the curious toward a more complete understanding of the ancient knowledge of the eternal truth of the universe of which the Masons are the keepers. From the great antiquity of Masonic symbols and traditions to the formation of the organization with their perpetuation as its goal, this 1909 book is an intriguing glimpse inside one of the most secretive fraternities in existence. It is required reading for those fascinated by arcane wisdom and secret societies.